staying in the highest branches, the ones we can't possibly reach anyway. It's a great year for mulberries, and I am reveling in it! A part of me was surprised that the mulberries came back. Even though there wasn't any real reason why the mulberries wouldn't faithfully return, I waited and watched for the telltale signs--those itty bitty white knobs that would swell in their own time into purple-black orbs-- and became giddy when I spotted the first ones. Maybe I was anxious because last winter was particularly harsh, cold, and long; every sign of spring and summer has been extra welcome this year. When the first berries were ready to pick, I was happily focused as each one yielded easily between my fingertips and into my palm; I could feel the satisfaction building. The berries had indeed returned, with glory, and I was finally getting another shot at mulberry jam. Simon on the other side of the fence, gathering mulberries. when we end up on her side. Last year's jam disaster had left me hanging, dissatisfied. I wanted a new chance to make something great with the mulberries we worked hard to pick, but I had to accept with somber realization that a new chance wouldn't come for an entire year. At the time it was very hard to swallow, but if there is anything guaranteed in life, it's that the months will pass, and the seasons will cycle. My new chance came, as promised by nature. This year I planned to not only attempt to make jam, but to do it without using commercial pectin. You read that right. And maybe it was a crazy idea. In fact, it didn't work out as planned, but it's all okay. I'm loving the learning process. The kids and I spent 2 hours yesterday morning jamming and canning, only to end up with mulberry syrup--canned and ready to store on the shelf--but still, not jam. So, why on earth would I even attempt to make jam without commercial pectin? Because it can be done. And I want to be one of those lunatics who has to do everything just a little differently. There is something that appeals to me about methods that seem more traditional and less reliant on store-bought additions, kind of the same way fermenting foods and baking bread calls out to me. It feels instinctual, imprinted on my genes somehow. Commercial pectin will give you beautiful results almost every single time (unless you are a total newbie like me), and that's great. Most people would think 'why bother? And what's wrong with commercial pectin?' Well, I wouldn't say there's anything wrong with it, except that I couldn't find a single brand that didn't contain dextrose. I wasn't excited to be adding another processed sugar to my fruit, when I was already going to be adding gobs of white sugar. But see, I don't do everything the way my ancestors did, nor do I feel like I have to embrace every modern technology every time. I like mixing old with new. I like having options. I would like to be able to use the pectin when I want, and then sometimes, I'd like to try out an interesting, not-your-everyday-canning recipe. Even commercial pectin doesn't promise perfect results for this newbie. The cherry jam on top is separated, the dandelion jelly at the left is a bit lumpy and bubbly. And then there is my pectin-less mulberry syrup on the right. None of them perfect, but all of them tasty. I placed items for a photo shoot on his precious lounging area. I was first introduced to making jam without boxed pectin when I read the book below. Liana Krissoff is a canning genius. She writes about canning simply but treats it like a beautiful art form (along with inspiring me with a ton of awesome recipes, this book also got me finally making my own yogurt). Krissoff uses Granny Smith apples, which are very high in pectin, to prepare many jams. She boils the apples with the fruit (coring and quartering them, putting all cores and seeds in cheesecloth), and most of the recipes don't require a lot of cooking time. I am not blaming the apple method for my lack of success, I'm blaming my lack of knowledge about jam making. I did a little digging last night in some canning books, and realized what was probably my biggest error--simply not cooking the mulberries long enough. I used a candy thermometer and I got the mulberry syrup boiling, at 220 degrees, but I only had a full boil for maybe 2 minutes, instead of 15-20 like the recipe suggested. Oops. think I was afraid of burning the jam. I tested the gel by putting it on a cold plate to see if it would wrinkle--it did not. Despite the signs that the jam wasn't ready, I went ahead and decided it was okay. Jam-making is still a little awkward for me, and I just don't have enough experience or intuition to realize what 'getting to the gel point' even is. The biggest part of learning is doing, and I plan to try, try again! One huge benefit received from making jam using apples instead of pectin? Once you are finished cooking, the apples left over are un-be-lievably delicious. One of the girls and I sat down and devoured the mulberry sweet apple flesh from each leftover piece. I cannot even describe the goodness involved. "Jam is often a cook's canning debut. It's tasty and pretty and fun to give to friends. I have to say, though, that jam can be tricky, particularly if you expect the homemade jam to be just like the store-bought kind. Some of the most experienced canning pros hit a jam hurdle every once in a while. I say, 'So what.' We're not out to win any blue ribbons here. We're in this to feed our families, our friends, and ourselves. A jam that's a little loose is still a gorgeous, delicious sauce for ice cream or waffles. One that's a little stiff is still a shockingly good thing to whiz into a smoothie or, dare I say it, downright decadent blended into a margarita.' "
Oh yes, 'ruined' jam can be used in many ways. My personal favorite is to combine it with tangy yogurt (chia seeds, which you can see were tossed into the mulberry-yogurt bowl below, are a nice addition). I can already imagine some frozen day in January, when summer is long forgotten and we are forced to struggle into heavy coats and mittens each day; I'll open up a can of my mulberry syrup, swirl it into homemade yogurt, and feel summer come blasting back to my senses. Mulberry flavor means summer, and those delightful bites will bring back priceless memories from early summer. Canning our berries, whether as a jam or an unintended syrup, means we get to access to warm memories later on just when we need them. The Rest of the Mulberries Will Not Be Jammed...Stay Tuned! I have another pound of mulberries in the fridge, and a good amount of berries still ripening on the tree. I will be trying something totally different with those--not jam related in any way--something simple but that I'd never thought of before! Stay tuned...I think it's going to be awesome. This recipe is from Canning for a New Generation by Liana Krissoff. Sterilize jars and keep them hot in the canning pot. Put a small plate in the freezer and put the flat lids in a heatproof bowl. Quarter and core the apples, reserving the cores and seeds. Put as many of the apple trimmings as possible in a jelly bag or 4 layers of cheesecloth and tie the bag closed. Put the blackberries and sugar in a wide, 6- to 8-quart preserving pan. Bring to a simmer, stirring frequently, then continue to cook until the juices are just deep enough to cover the blackberries, about 5 minutes. Pour into a colander set over a large bowl and stir the berries gently to drain off the juice. Return the juice to the pan along with the apples and the bag of trimmings. Bring to a boil over high heat and cook, stirring occasionally, until the syrup is reduced and thick and registers about 220 degrees on a candy thermometer, 15 to 20 minutes. Return the blackberries and any accumulated juices along with the lemon juice and zest to the pan. Bring to a simmer. Simmer, stirring frequently, until a small dab of the jam spooned onto the chilled plate and returned to the freezer for a minute wrinkles when you nudge it, about 10 minutes. Remove from heat. Stir gently for a few seconds to distribute the fruit. Remove the bag and the apples. Ladle boiling water from the canning pot into the bowl with the lids. Using a jar lifter, remove the sterilized jar from the canning pot, carefully pouring the water from each one back into the pot. Place them upright on a folded towel. Drain the water off the jar lids. Ladle the hot jam into the jars, leaving 1/4-inch headspace. Use a damp paper towel to wipe the rims of the jars, then put a flat lid and ring on each, adjusting the ring so that it's just finger-tight. Reutrn the jars to the water in the canning pot, making sure the water covers the jars by at least 1 inch. Bring to a boil, and boil 5 minutes to process. Transfer the jars to the folded towel and do not disturb for 12 hours. Check the seals by pressing down on the center of each jar. If it can be pushed down, it hasn't sealed. Store the jam in the refrigerator for up to a month. I never heard pectin in jam making until I started to collect recipes in English. No one uses in Turkey. No one uses apples either. Just a squeeze of lemon near the end of cooking time. We don't can the jam either. It is made seasonally and eaten right away. Excellent post, Andrea. One of the reasons I planted a crabapple tree a few years ago was to eventually make all my jams and jellies without commercial pectin. It's only just got a few fruits for the first time this year, so it's exciting to think about trying all this myself. It's true even commercial pectin doesn't produce guaranteed results, for long time jam and jelly makers either! But we love those fruit syrups on pancakes and ice cream so not real loss. I also love mulberries and have thought about planting a couple of mulberry trees. I grew up in Illinois and recall mulberry picking expeditions and mulberry jam making. I also like the idea of reducing fruit juices for syrups and molasses! Silk worms eat only mulberry leaves, wild mulberries producing darker silks, commercial ones producing white silk. It's a wonderful tree actually, but not everyone knows about them. Thanks for your reply, Leigh. You have inspired me; crabapples are the PERFECT thing! I have access to a few in the neighborhood that go to waste every year, because there is not a whole lot you can do with them. Thanks for making me think of this! I hope you plant mulberries, because I agree; they are wonderful. 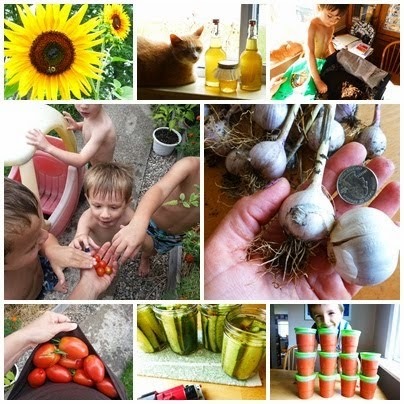 http://www.littlebigharvest.blogspot.com/ An amazing blogger who has helped and encouraged me in starting this blog. She has an amazing family childcare and gardens with her kids as well. Connecting with people whose passions are like yours is such a blessing! Awesome post, Andrea! "I like mixing old with new. I like having options" -- I can relate to this so much, which is why I am so thankful that you posted this recipe! Sometimes I simply don't want to add commercial ANYTHING to something I'm making from scratch. But most no-pectin recipes I've tried are a flop. Yours sounds spot-on + I can't wait to try it! What a great post this is! I love mulberries too... I definitely need to plant a mulberry tree.. or five lol! I'm like you, I like mixing old & new things together. I like learning how to do things different ways as well.